Pulse can supply and install heating elements to your cars existing seats, converting them into luxury heated seats as fitted into top of the range models. 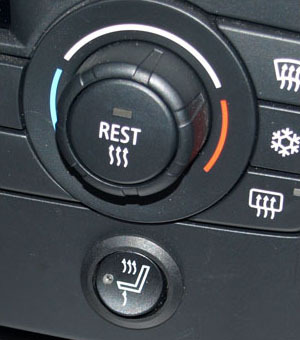 Like most quality OEM systems, Pulses heated seat solutions use carbon fibre heating elements. This advanced technology has a number of benefits. The heater elements heat up very quickly and evenly. 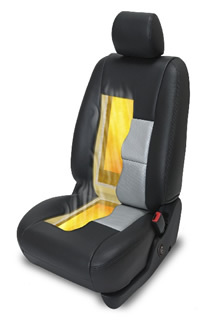 They fit unobtrusively under the leather or cloth of the seat and they are longer lasting than copper wire systems. Appearance is important when adding to your car. Our systems use excellent original equipment style switches. So whether its a two heat or variable system you require we have a system to suit your needs. Heated seats are becoming one of the most popular upgrades to a BMW interior whilst Audi heated seats are seen by many as a must have feature. Why endure cold seats when you can easily have seat heaters professionally installed? Rear seat options available also.